On GigMasters, you can find pretty much everything you need to plan a dream wedding: photographers, DJs, bartenders…and now you can even hire a bridesmaid! 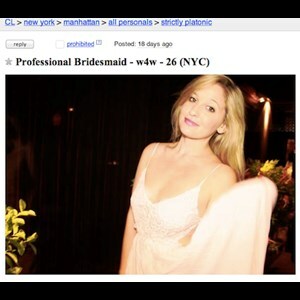 Jen Glantz – of the notorious Craigslist post – has started a legitimate professional bridesmaid business. She perfected the art of being a bridesmaid after being asked to serve four times in just one year. After posting her newly-honed services on Craigslist she was flooded with requests from desperate brides worldwide. Now she’s stepped up her “what if” idea into a full-blown business – complete with website and GigMasters profile. She offers 4 packages with different levels of involvement and help for brides and their bridal party. Brides can hire her for a range of services - from herding bridesmaids during planning to actually standing up for the bride on her big day. Includes weekly consultation sessions via skype with the bride and/or the bridal party to assist in ongoing planning and facilitating of events and activities leading up-to and during the wedding. Includes everything listed in the ‘undercover bridesmaid’ package + in-person participation and ground support at pre-wedding and wedding day event. Includes everything listed above + actual participation as a bridesmaid or maid-of-honor in the wedding party. She says that other bridesmaids are very accepting – even welcoming - to her presence. “Regardless of if I am walking down the aisle or wearing the bridesmaid dress – I’m there to assist and make sure the bride and her wedding party have what they need and are stress-free” said Glantz. She has requests for her services constantly rolling in. So many, that she’s recruiting. Glantz says she gets lots of messages from women who want to be professional bridesmaids. In addition to the bridesmaid/coordinator/bride-whisperer work, Jen also offers speech writing and help dreaming up surprises for the bride, groom, or wedding party. Check out Jen Glantz, Professional Bridesmaid on GigMasters. Request a quote and find out how a bridesmaid for hire can help you.